Two sponges and simple things. That was the furnitures which Haj Muslim furnished one of the rooms in Al Kef Alaswad village (Baneh Shekafty). He stayed there after an invitation from a driver that works on Semalka border crossing which located on the river of the Tigris (that connects Syria with the Kurdistan Regional Government in Iraq ). I met him while he awaited with hundreds of Kurdish families, who run away from Raqa after the ultimatum they received from the Islamic State which indicates that they should leave within three days. Haj Muslim considered lucky in comparison with other families who has been waiting for weeks at the gates of the border crossing under the sun while the authorities who controlled the entrance look into their cases. Haj Muslim and his wife took part to tell the story of the painful journey that they suffered due to the exodus with other families from the Kurdish populated areas in Raqa city (Al remela, Al deraa and Al-Andalus). Likewise happened in the cities of al-Tabqah, Kobanî and Tell Abyad , eventually Semalka. Some families preferred to go to Turkey while others stayed in Tell Abyad and other cities like Al-Qamishli,and Al-Malikiyah As for other families, they awaited a miracle for the border crossing to open so they join their children who work in Kurdistan Regional Government in Iraq. From hundreds of families that anticipated mercy, only a single family managed to reach the other side of the borde. Haj Muslim thinks the daughter of that family is an activist in Erbil, who secured their passage. Haj Muslim, who is seventy five years old, after I gave him a cigarette goes back in memory to describe his life under the Islamic State . Although he has heart problems, he did not stop smoking and did it secretly (under the Islamic State rules ) at his home and he was forced to go to mosque in Al Remela where he lived since 1976 . Previously, Haj Muslim was forced to leave Tell Abyad when the Syrian regime brought Badwine tribes and settled them there after stealing the agricultural lands in that area off its owners. 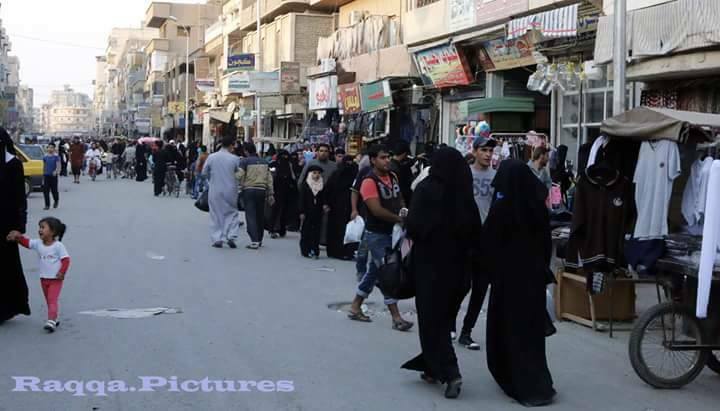 His wife Zahra interrupts him, “Life in Raqa like other cities we passed in regard to public service and prices of food. The Islamic State did not follow a discriminatory rules against Kurdish residents of the city until the fighting started in Tell Abyad between them and the Kurdish people protection units”. Never Haj Muslim grew a beard and said that he “ never left his habit to use a classical razor, but he has to let his beard grow a bet , before going out or commuting to the mosque on Friday to listen to the compulsory sermons. Which usually encourage people for Jihad in the name of Allah. He answers my question of how the Islamic State differentiated Kurds from Arabs when they asked to leave Raqa by saying that most Kurds have their civil records belonging to Tell Abyad and its province. As the Haj describes, despite what happened lately, Kurds and Arabs in the city showed strong social cohesion due to relations that bond them something made him give his house to an Arab family they trust until they come back while he repeated his thirsty desire to go back to the hood where he grew. Al Kaf Alaswad village, is several kilometres away from Semalka border crossing with too much anxiety and resentfulness for the old man about his house in Raqa. But the fear from the Islamic State still reside inside him and his family. It is shown on his face when I asked for a personal photograph. He refused, fearful that the Islamic state will confiscate his house in Raqa, the entity that he left there, where there is fear and horror.